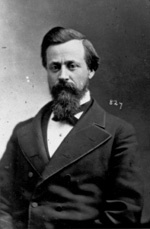 BLAIR, Henry William, a Representative and a Senator from New Hampshire; born in Campton, Grafton County, N.H., December 6, 1834; attended the common schools and private academies; studied law; admitted to the bar in 1859 and commenced practice in Plymouth, N.H.; appointed prosecuting attorney for Grafton County 1860; during the Civil War served in the Union Army as lieutenant colonel of the Fifteenth Regiment, New Hampshire Volunteer Infantry; member, State house of representatives 1866; member, State senate 1867-1868; elected as a Republican to the Forty-fourth and Forty-fifth Congresses (March 4, 1875-March 3, 1879); was not a candidate for renomination in 1878; elected as a Republican to the United States Senate on June 17, 1879, for the vacancy in the term ending March 3, 1885, and served from June 20, 1879, to March 3, 1885; the State legislature not being in session, he was appointed on March 5, 1885, and elected on June 17, 1885, to fill the vacancy in the term beginning March 4, 1885, and served from March 10, 1885, to March 3, 1891; unsuccessful candidate for renomination in 1891; chairman, Committee on Education and Labor (Forty-seventh through Fifty-first Congresses); declined an appointment as judge of the district court for the district of New Hampshire tendered by President Benjamin Harrison in 1891; was appointed Envoy Extraordinary and Minister Plenipotentiary to China March 6, 1891; he was objected to by the Chinese Government as being persona non grata; subsequently tendered his resignation which was accepted October 6, 1891; elected as a Republican to the Fifty-third Congress (March 4, 1893-March 3, 1895); was not a candidate for reelection in 1894; engaged in the practice of law in Washington, D.C., until his death on March 14, 1920; interment in Campton Cemetery, Campton, N.H.
American National Biography; Dictionary of American Biography; Crofts, Daniel W. The Black Response to the Blair Education Bill. Journal of Southern History 37 (February 1971): 41-65; McKinney, Gordon B. U.S. Senator Henry William Blair and the Labor and Capital Hearings of 1883: An Industrial Economy in Microcosm. Historical New Hampshire 56 (Spring/Summer 2001): 20-33.